I have designed some observing list for use in New Zealand and Australia. For each month I have come up with some lists to help people know what to observe each month. Often it is difficult to know what to observe and people tend to look at the same objects each night. Not to say that looking at the Dumbbell planetary nebula isn't allowed every time it is available to be observed!! The real aim of these lists is get people to a level of proficiency that allows any object to be located using starhopping and finders. 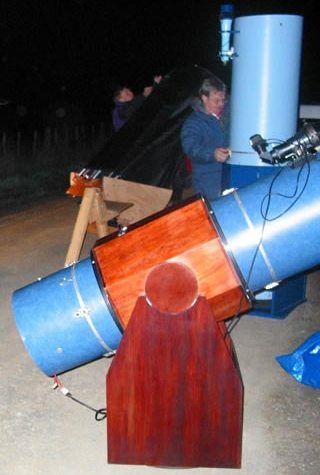 The observing lists have been designed with objects for all sizes of telescopes and observer ability. Try the Easy objects first and work your way down the lists until you can move to the next level. You will need a good star chart to use with these lists. I recommend a good entry level star chart, such as the Cambridge Star Atlas to start you on your way. The Cambridge Star Atlas covers the whole sky in 20 overlapping full color charts that show stars to magnitude 6.5 and about 900 non-stellar objects such as clusters and galaxies that are visible in binoculars or a small telescope. There are some free skycharts, so I will provide links on each page to the appropriate charts. The Easy objects are for people who are starting out or have telescopes that are around 100mm in aperture. The Medium objects are for those people who can identify their way round the sky and have a telescope less than or equal to 200mm. The Hard objects are for people who have telescopes that are larger than 200mm in aperture and are proficient at starhopping or who have Digital Setting Circles. Do not feel limited to the objects in one category. Push your skill and equipment and see if you can identify objects in the category above.